These spectacular sites are vulnerable to what amounts to commercial looting. Can high-quality facsimiles replace stolen art and let the public interact with otherwise prohibitively fragile objects? “UNESCO explained that damage had already been inflicted by armed groups at or near the sites. It feared that worse could follow”. But he has been ordered to stay away from museums and libraries. The theft was recorded on a security camera installed within the church. They also say that the sacred art department of the Dioceses of Querétaro is charged with security at churches. A statement of concern from the Diócesis of Querétaro following a church theft in Amealco. The state must protect sacred art and be transparent about threats to it. A truly stunning haul including textiles, vessels, and a complete mummy. Helga Wall-Apelt is suing the museum for breach of contract regarding a new wing for her donated collection. Discussion of the threats to the Bear Ears area. The artefacts were transferred as part of a state investigation into the nonprofit Surface Interval Dive Co. This is a common occurrence at US National Parks and other historic sites. The thief stole three pairs of tefillin. The thief took money from a cash register and donation box as well as 3 civil war buttons. The theft of the civil war buttons has had an emotional impact on museum staff, an aspect of art crime we rarely consider. The paper’s editorial staff urges all of New Mexico’s congresspeople to back legislation that would make dealing in Native American antiquities more difficult. Digital devices seized from Olivier Thomas have revealed photos of the disputed artworks, allegedly taken by Thomas himself. An “expert” that was tasked with authenticating the piece ran off with it. It is unclear why they think they can sell it on since it is so obviously stolen. Bavarian authorities tasked with returning art to Jews actually ended up giving the pieces to Nazis. Several sacred items were taken from the Orthodox church. Some family booklets and photos seized during the Franco era, are being returned. The five pieces were stolen from a Spanish banker’s home in Madrid. Some good arguments, but unlikely to gain any new traction. Advertising the TV show Fake or Fortune, Freud always said it wasn’t his work. This was due to construction work to install a doorway. One of the artists is now being held in Australia for vandalism offences. Stolen idols and restricted wood were being smuggled together in a shipment that was purposefully mislabelled at Chennai Port. Another temple in the area was robbed on 7 July. The 84-year-old accused idol smuggler has been remanded to judicial custody until 27 July. Idols with silver masks and donations were taken from the Karnakata temple. 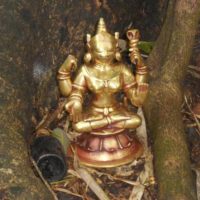 The statue was found dumped under a banyan tree. The problems are more systematic and deep-rooted, a seizures won’t change the insecurity. A long read recapping much of the Kapoor case up to this point. The idol was taken from Maa Uma Maheshwari Temple located near Kurua Gaon. The task force is committed to discovering the motive behind the spate of vandalism at Hindu temples. This is the fifth case of temple break in in Penang in the past two months. The Israeli PM apparently did not know he was doing something illegal. The list of World Heritage Sites at risk has been announced. One of the men detained claimed he got the artefacts in exchange for a house he had sold. There’s meant to be a ban on buildings that are “oversized”, “xenocentric”, or “weird”. The game encourages players to visit heritage spots, but some are deemed too solemn for hunting Pokémon. Ground penetrating radar results turned out to be wrong. No cavity found. A triumphant return for the painted Zebra!